Pork is a popular alternative to beef because it generally contains fewer calories per serving and, depending on the cut, can serve as a leaner source of protein than some cuts of beef. However, it also contains some cholesterol, a type of lipid that can contribute to health problems in some people. The actual amount of cholesterol in a serving of pork depends on the cut, and how it's prepared, but several cuts fit well into a cholesterol-controlled. The body needs cholesterol to help produce hormones and vitamin D. However, the liver produces about 1,000 mg of cholesterol each day on its own, which is enough to support all the body's needs. It's nearly impossible to avoid foods that contain at least some cholesterol. You should generally limit your cholesterol intake to about 300 mg each day, and just 200 mg if you have a family or personal history of coronary heart disease. When selecting pork, seek out packages with labels such as "choice" or "lean," as these cuts generally have much less fat and cholesterol than other varieties. Sources of pork with the least cholesterol per serving include broiled and roasted center-cut chops and loins without the bone. Each of these cuts contains fewer than 60 milligrams of cholesterol per 3-ounce serving. Stew meat and cube steak each have slightly more than 50 milligrams of cholesterol per 3-ounce serving as well. Roasted and broiled chops and loins that contain the bone tend to have slightly more cholesterol, with about 60 to 70 milligrams per 3-ounce serving. Country style ribs also contain a moderate amount of cholesterol, with about 75 milligrams of cholesterol per 3-ounce serving. Regular cuts of pork without "choice" or "lean" labels tend to have about 10 to 20 milligrams more cholesterol per serving. Ham shanks and ground pork each contain about 80 milligrams of cholesterol per serving, while baby-back and spareribs can have about 90 to 105 milligrams of cholesterol. One slice of bacon contains about 9 milligrams of cholesterol, while a 3-ounce serving of bacon contains over 90 milligrams. Using a 1 tbsp. 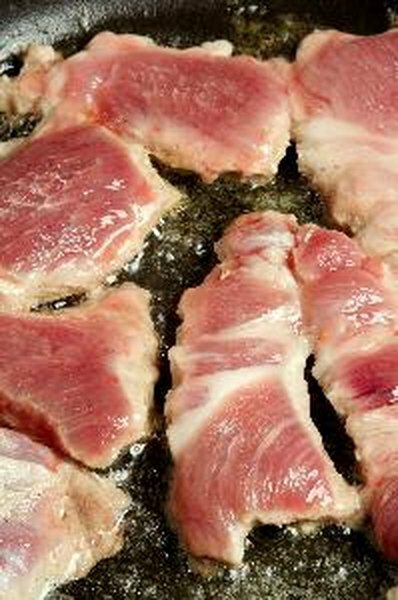 serving of butter for cooking can add about 30 milligrams of cholesterol to any pork product.